Christmas shoppers were told to abandon their vehicles today after massive queues caused chaos at West Orchards shopping centre. 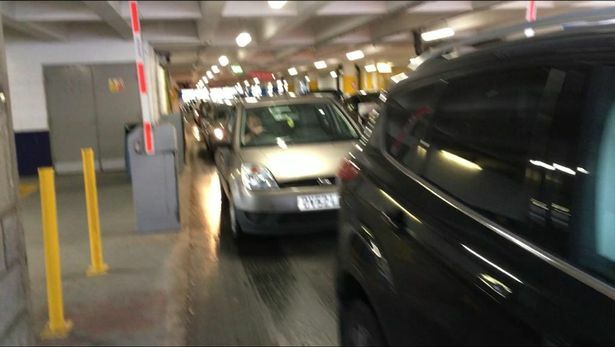 Those heading out to complete a final bit of festive shopping were left inching out of the shopping centre's car park - with some frustrated motorists saying they had been stuck in queues for two hours. As complete gridlock hit, security teams at West Orchards began advising motorists to leave their cars and use public transport to get home. One man said his family - including his wife with his eight-week-old baby - had to walk to Coundon and retrieve their car later. He said: "They are now having to walk back to Coundon as I have school pick ups to do." One lady exiting the West Orchards car park told CoventryLive: "I arrived here at 9am, to go to Debenhams specifically, but because the tills had broken down they didn't open until 10.45am." It wasn't just the West Orchards car park that was full earlier either. Elsewhere, the Belgrade Car Park was full, although the exits were flowing freely, and city centre spots at Manor House at and Silver Street were also at capacity. One man said his family had to walk to Coundon and retrieve their car later. He said: "My wife, eight-week-old daughter and mother-in-law have been told by security to leave their car and find other ways out of town. "They are now having to walk back to Coundon as I have school pick ups to do. "Security have advised it's the traffic from the ring road then backing up next to the Belgrade that has become gridlocked. "It is just a bit frustrating as wanted to be back by 1pm so went in early, but traffic was going nowhere. "Seems to be a common thing with West Orchards as the road layout around the area does not allow for flow of traffic at all and there's only one way out of West Orchards car park." West Orchards referred enquiries to the council, whose spokesperson said: “It is a very busy shopping day and the West Orchards car park is busy - but the road network is moving including Corporation Street. I'm only surprised that anyone still shops in the city centre? I always avoid it like the plague. The idiots have not accounted for near capacity of the roads in/out of the city. This is what happens when you have rank amateurs doing what is a professional job. With the coming city of culture, and all the visitors predicted ( ) the roads will be at a standstill most of the time!